Moon Jae-in of the Democratic Party of Korea has just been elected South Korea’s new president. This is the second conservative-to-liberal transition of power in the country’s democratic history. It began unexpectedly last October, with the eruption of a corruption scandal involving then-President Park Geun-hye, culminating in her impeachment and removal from office earlier this year. Although Park’s ouster was painful, it also demonstrated the resilience of South Korea’s democracy. Moon will take office at a time of heightened tensions with North Korea. 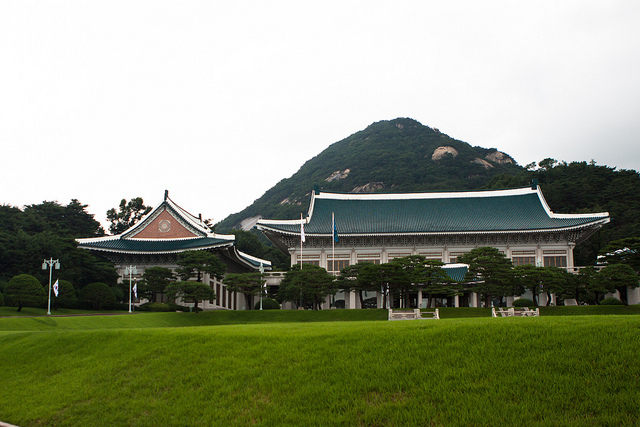 To understand what kind of policy he will pursue requires familiarity with liberal foreign-policy thinking in South Korea since the 1998–2003 presidency of Kim Dae-jung. Kim had watched the Cold War come to a peaceful end in Europe, and he wanted to bring his own country’s ongoing confrontation with the communist North to a similarly nonviolent conclusion. So he pursued direct engagement with North Korea, and his ‘Sunshine Policy’ was taken up by his successor, Roh Moo-hyun. Before he died in 2009, Roh (under whom I served as Foreign Minister) was a political mentor and close friend to Moon. German reunification, preceded by West Germany’s policy of direct engagement, or Ostpolitik, with East Germany in the last decades of the Cold War, was a source of profound inspiration for Kim. Former German Chancellor Willy Brandt began pursuing Ostpolitik in earnest in the 1970s, and Helmut Kohl maintained the policy after he came to power in 1982. Although Ostpolitik could not change the East German regime’s nature, it did make East Germany heavily dependent on West Germany, and gave Kohl significant political leverage during the reunification process. Of course, most Korean liberals recognize that North Korea is not East Germany, which never threatened West Germany or the United States with nuclear weapons. But Moon and his supporters nonetheless find it regrettable that conservative South Korean presidents since Lee Myung-bak did not maintain the Sunshine Policy, as Kohl had done with Ostpolitik. If they had, North Korea might have become more dependent on South Korea than on China, in which case US and South Korean leaders would not have to plead constantly with China to rein in the North Korean regime. South Korea’s liberals also recognize that the strategic situation has changed significantly since the Kim and early Roh eras, when North Korea had not yet become a de facto nuclear state. To realize his liberal dream of national unification, Moon will have to confront a much larger challenge than anything his predecessors faced. Moon will still pursue his dream, but he will do so prudently, and with an eye toward geopolitical realities. In a recent interview  with the Washington Post, he made it clear that he sees South Korea’s alliance with the US as the bedrock of its diplomacy, and promised not to begin talks with North Korea without first consulting the US. But, beyond formal talks, he could also try to engage with the North by reviving inter-Korean cooperation on health or environmental issues, which fall outside the scope of international sanctions. Over the last nine years, conservative presidents—especially Park—cut all contacts with North Korea to try to push it toward denuclearization. South Korean liberals argue that this policy compromised the national goal of peaceful reunification, by turning it into an empty slogan. They believe that maintaining inter-Korean relations will lay the groundwork for reunifying the Peninsula, just as Ostpolitik did in Germany. Thus, Moon will most likely pursue a two-pronged strategy that pairs denuclearization with engagement and preparations for eventual reunification. Moon has acknowledged that strong sanctions will be necessary to bring North Korea to the negotiating table. So his government will have no fundamental disagreement with the US, especially now that Secretary of State Rex Tillerson has said  that the US is not seeking regime change in North Korea. Moon will also have more flexibility than his conservative predecessors to accommodate a US-led Iran-style deal aimed at freezing North Korea’s nuclear and missile activities. But if US President Donald Trump tries to make South Korea pay for America’s recently deployed Terminal High Altitude Area Defense (THAAD) anti-missile system, Moon will have to refuse. Otherwise, he would face a serious domestic backlash from both the left and the right. A final but crucial issue is China, with which Korea has had a bitter history. China has intervened whenever it has viewed the Korean Peninsula as a potential beachhead for an invading maritime power. China intervened in 1592, when Japan prepared to attack the Ming Dynasty by first subduing Chosŏn Dynasty Korea. It happened again during the Sino-Japanese War of 1894, and then during the Korean War in the early 1950’s. Despite this history, Korean liberals recognize that Chinese cooperation will be necessary for achieving reunification. Accordingly, Moon’s government will have to maintain a rock-solid alliance with the US while trying to improve relations with China, which have cooled since South Korea decided to host the THAAD system. Moon might try to soothe Chinese concerns by suggesting that the system is temporary , and could be removed, pending North Korean denuclearization. Those who predict that a Moon presidency will disrupt South Korean relations with the US and Japan are surely mistaken. After all, it was during the liberal Roh presidency that South Korea concluded the South Korea-US Free Trade Agreement, allowed for US troops to be redeployed within its borders, and dispatched its own troops to fight alongside the US in Iraq. Moon will affirm that legacy and attempt to revive another, an updated and renewed version of the Sunshine Policy, which embodies South Korea’s most fundamental long-term aspiration. Yoon Young-kwan, former Minister of Foreign Affairs of the Republic of Korea, is Professor Emeritus of International Relations at Seoul National University. This article is presented in partnership with Project Syndicate © 2017. Image courtesy of Flickr user Jirka Matousek.